In 2009, I wrote a column headlined, “Why is scrimmage dessert?” – because I had observed so many practices for young children that bothered me. They were soccer practices without kids playing soccer -- until the very end, when the “scrimmage” was served up like a reward, dessert after eating broccoli. A series of drills comprised the first phases of the practice before the children finally got to play. After a long day at school, mostly sitting down, the kids eagerly came to the field thinking it's time to play soccer – only to encounter more adult instructions, more lessons, and waiting in lines for their turn at a drill. How would Lionel Messi have turned out if an adult interfered when he and friends were playing in the streets of Las Heras and demanded, "Stop playing! First you have to do these drills before you get to play soccer"? I also saw how well-intentioned parent coaches struggled with implementing the practice plans they were told to use when a bunch of rambunctious kids showed up who wanted to run around, kick and chase the ball. And instead of letting the kids do just that, the coaches tried to corral them through some sort of cone maze. "When the first kid that shows up, it'd be 1v1 with the coach. Then the second kid shows up and it's 2v1 against the coach. The third kid makes it 2v2 and then with the fourth kid arriving, the coach steps out and they play 2v2. With each additional arrival the game grew until everyone was there at practice. We’re talking about the age groups before injury-prevention warm-ups aren’t necessary and they’re too young for rondos. The way Lusson described it works wonderfully. It creates a much more time-efficient practice. Kids often show up at different times, so the earlier kids aren’t robbed of practice time because the coach is waiting for the whole team’s arrival. The children put their cleats on quicker because they're eager to join the fun. Most importantly, the children enjoy it – because it’s so much fun to try and score a goal. Kids love going to goal, which also happens to be the most important part of the game. And they’re more inclined to stay focused during a slower-paced activity after they've used up some energy. 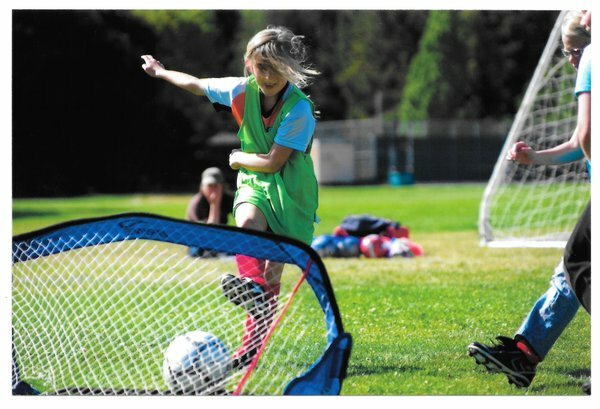 So, bravo to U.S. Soccer for recommending a Play-Practice-Play structure in its Grassroots Courses coaching courses -- "it gets them moving and playing immediately." Earlier this year, U.S. Soccer completed the revamping of its coaching licenses, replacing the E and F licenses with the “Grassroots Pathway.” It starts with a free 20-minute online "Introduction to Grassroots" module, the completion of which makes one eligible four two-hour Online Grassroots Coaching Courses: 4v4, 7v7, 9v9, and 11v11, and four in-person courses of the same categories. The online courses are hosted at U.S. Soccer's Digital Coaching Center (DCC) and cost $25. Taking the new, very well produced and convenient U.S. Soccer online Grassroots courses reminded me of when a decade ago I spent two days getting my entry-level license. The differences are striking. I remember thinking back then that the important stuff could have been covered in a couple hours -- not two days. That it was too much about drills. At times it became farcical when the instructor had a hard time getting a group of adults to figure out the path through the cones that we were supposed guide 6-year-olds through. A coach could have taken the course and run soccer practices in which the actual playing of soccer hardly figured into a practice session. The most important aim for coaches at the early ages I've always believed is creating practices so fun that kids might fall in love with the game so much they'll play with the ball on their own. What better way to discover the joys of soccer than to play?